Collector's Edition 2 disc GUARDIANS OF THE GALAXY vinyl includes AWESOME MIX VOL. 1, the collection of songs featured in the film. 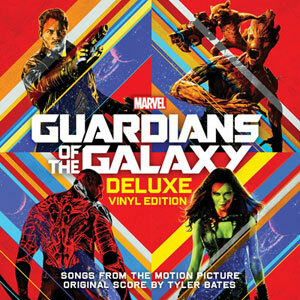 Music plays a major role in GUARDIANS OF THE GALAXY as the 1970s songs featured in the film are part of the storyline in a unique way. Explaining how the songs come to play in the story, director James Gunn says, 'One of the main story points in the movie is that Quill has this compilation tape (Awesome Mix #1) that he got from his mother before she died that she made for him. It was of songs that she loved, all songs from the 1970s, and that's the only thing he has left of his mother and that's the only thing he has left of his home on Earth. He uses that as a connection to his past and to the sadness that he feels of having left all that and lost all that.' As well as, the complete official original score from the film as composed by Tyler Bates.From Marvel, the studio that brought you the global blockbuster franchises of Iron Man, Thor, Captain America and The Avengers, comes a new team the GUARDIANS OF THE GALAXY. An action-packed, epic space adventure, Marvel's GUARDIANS OF THE GALAXY expands the Marvel Cinematic Universe into the cosmos, where brash adventurer Peter Quill finds himself the object of an unrelenting bounty hunt after stealing a mysterious orb coveted by Ronan, a powerful villain with ambitions that threaten the entire universe. To evade the ever-persistent Ronan, Quill is forced into an uneasy truce with a quartet of disparate misfits Rocket, a gun-toting raccoon, Groot, a tree-like humanoid, the deadly and enigmatic Gamora and the revenge-driven Drax the Destroyer. But when Quill discovers the true power of the orb and the menace it poses to the cosmos, he must do his best to rally his ragtag rivals for a last, desperate stand with the galaxy's fate in the balance.Marvel's GUARDIANS OF THE GALAXY, which first appeared in comic books in Marvel Super-Heroes, Issue #18 (Jan. 1969), stars Chris Pratt, Zoe Saldana, Dave Bautista, featuring Vin Diesel as Groot, Bradley Cooper as Rocket, Lee Pace, Michael Rooker, Karen Gillan, Djimon Hounsou, with John C. Reilly, Glenn Close as Nova Prime and Benicio Del Toro as The Collector. James Gunn is the director of the film with Kevin Feige, p.g.a., producing. Louis D'Esposito, Alan Fine, Victoria Alonso, Jeremy Latcham, Nik Korda and Stan Lee serve as executive producers. Marvel's GUARDIANS OF THE GALAXY is written by James Gunn and Nicole Perlman.